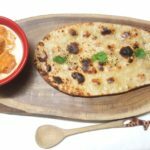 What is Makki di Roti? 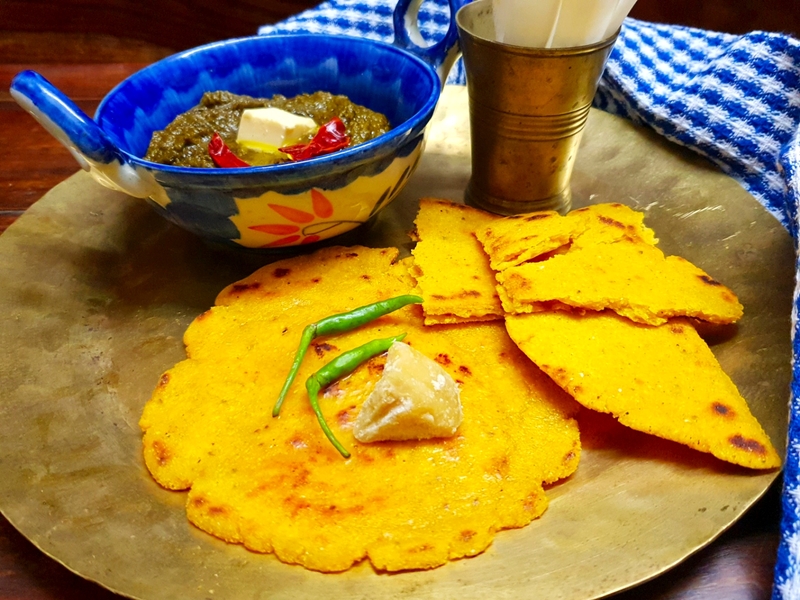 Makki di roti is the popular Punjabi flatbread made using cornmeal or maize flour. Makki mean maize, di stands for of, and roti means a flatbread, so makki di roti as in maize flour flatbread. The best way to relish this winters’ delight is with sarson ka saag. However, we have it with many gravies and chutneys and it tastes divine. 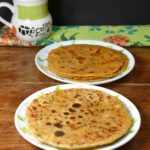 Makki ki roti calls for maize flour. 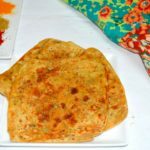 It is kneaded with lukewarm water and flavored with carom seeds (ajwain). The tricky part about making makki is roti is rolling it. Traditionally it is prepared by pressing between the palms, without the use of any rolling pin. That’s a bit umm… difficult! Another technique used to simplify the process of rolling makki ki roti is by using plastic bags. 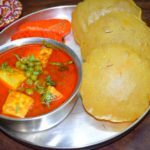 However here I am sharing a technique which is drastically simple and anyone can use it to make makki roti. I have used parchment paper and it works great. You have got to try it and see! 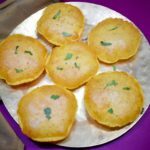 Another maize (makki) based recipe is of makki ka dhokla. 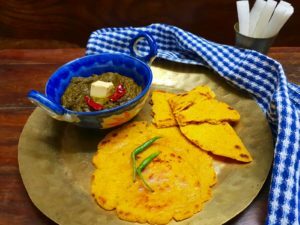 This recipe comes from the state of Rajasthan. Find it here. Another winter’s delight that I would like to mention here is gajar ka halwa. It is the most popular dessert in winters. Find the recipe here. 1. In a mixing bowl take 3 cups maize flour (makki ka aata), salt to taste, 1 tsp carom seeds (ajwain) and 1 tbsp clarified butter (ghee). 3. Use lukewarm water to knead the dough. 4. Make a soft dough. Keep aside for 10 minutes. 5. Thereafter divide dough into 6 portions. 6. Before rolling into chapatti, knead the portion separately. 7. Make a ball. Flatten it. Roll it in maize flour. And place on a parchment paper. 8. Put another parchment paper on it. 9. Roll using a rolling pin with very light hands. Simultaneously heat the skillet. 10. Just remove the parchment paper on top of chapatti. Lift the one on the bottom. 11. Transfer on a hot skillet. Chapatti facing the skillet (obviously). 12. Remove the parchment paper. 13. Let it cook partly from both sides. Cook on medium flame. Apply ghee on both sides. 14. Cook on medium flame till golden brown patches appear. 11. Transfer on a hot skillet. 13. Let it cook partly from both sides. Cook on medium flame. Apply ghee on both the sides.